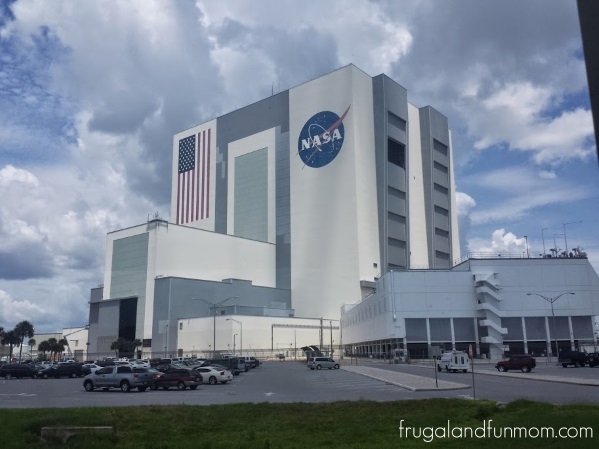 I was provided press passes to Kennedy Space Center to facilitate this post. Opinions expressed are that of my own. 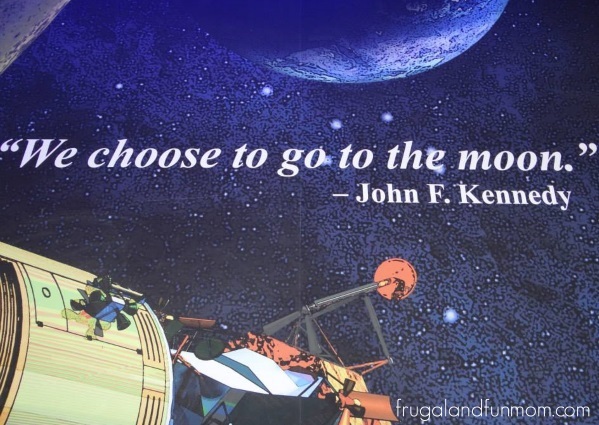 I have lived in Florida for most of my life and one of the places I have always wanted to visit was the Kennedy Space Center. NASA is and was an important part of history, and I have always looked up to Astronauts and the scientists that have made this voyages possible. I also have been fascinated with Space and really enjoy Sci-Fi type genre whether Movies, TV Shows, or Books. This piece of our past has laid the ground work for so much technology of today, and I think it is important to teach kids about where it all began. 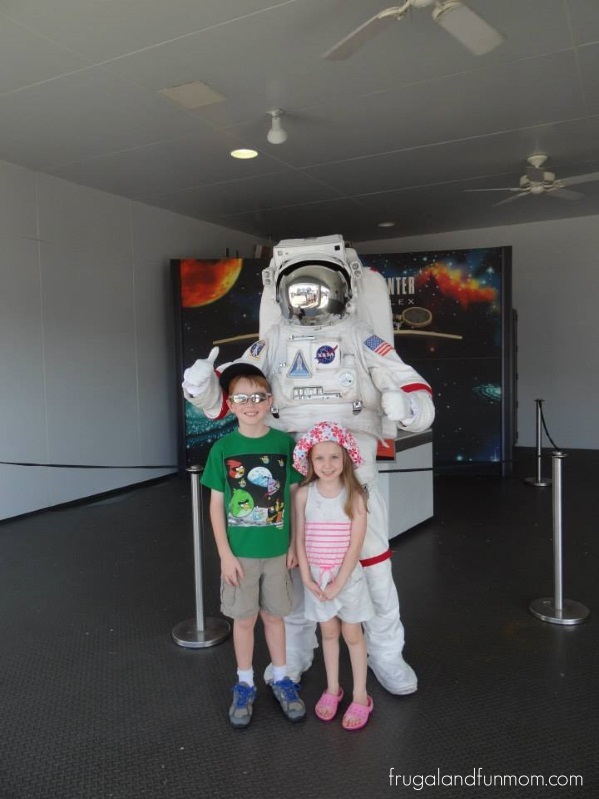 My husband and I are pretty nostalgic about the Space Program, and this summer we got to see it first hand and introduce our children to it as well. 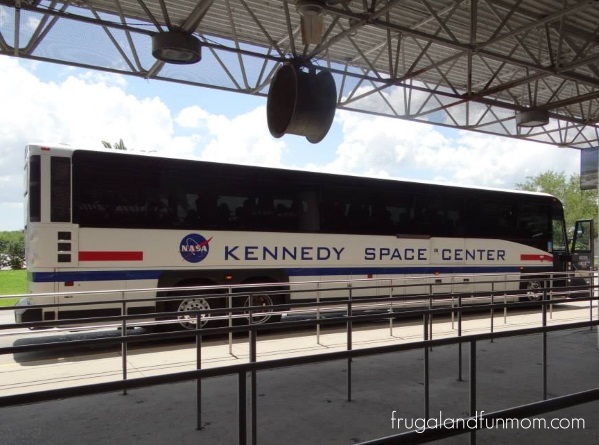 When we arrived at the Kennedy Space Center, it was recommended that we immediately take the Space Center Tour. They have multiple buses running every 15 minutes that travel around the facility. We headed over that way, and after about 30 minutes we were on a bus. The seats were comfy and we all just sat back and enjoyed the ride. He then mentioned how he used to drive limousines and chauffeured well known journalists Walter Cronkite and Dan Rather, to witness one of the rocket launches. As we went around, our driver showed us the VAB – Vehicle Assembly Building and shared interesting facts about structure. 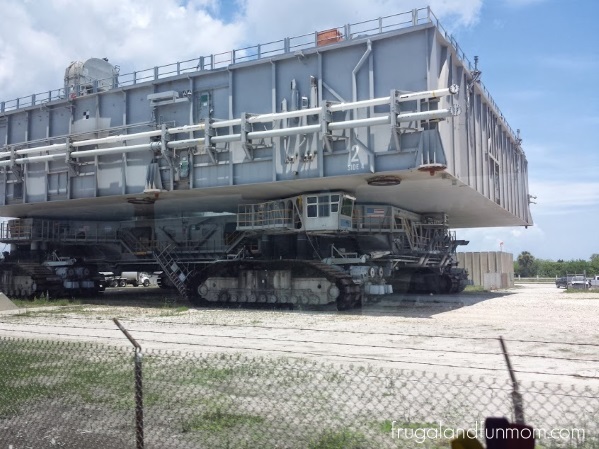 Next, he drove us past a 5 million pound Crawler Transporter that was used to take the Shuttles to launch pads. I could not even wrap my head around 5 million pounds. We then went past a few empty launch pads that will be getting some use soon. The Space X program and Boeing will be lifting off new technology in the near future. 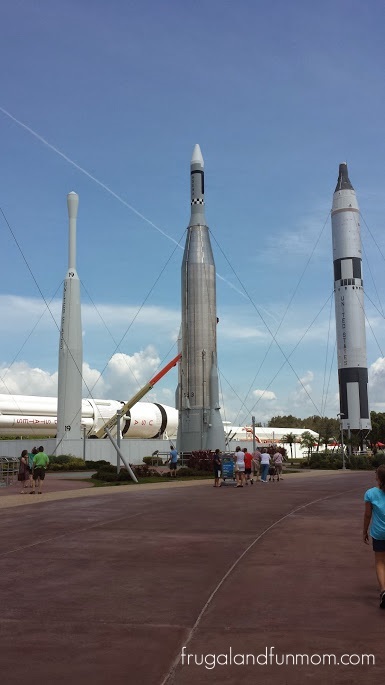 Once we were finished with the bus tour, (it lasted about 45 minutes) we were then dropped off at the Apollo/ Saturn V Center. This area took us back in time even before Hubby and I were born. I definitely got an education at this facility. 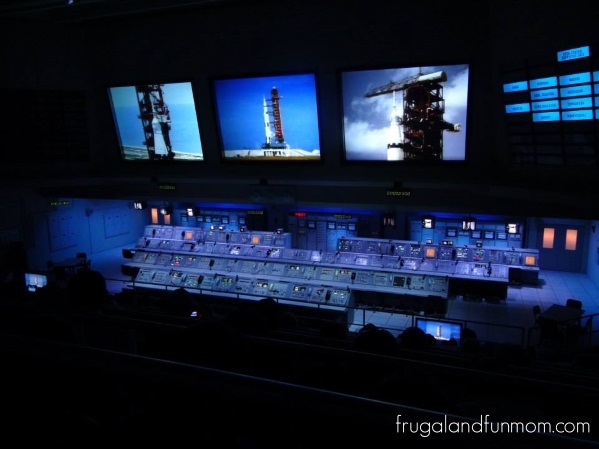 Upon entering, we watched a video and then witnessed a simulated take off of a Rocket Mission. Through special effects, it was almost like we were there when it happened over 40 years ago. Both my kids thought it was a real takeoff at first, it was awesome! 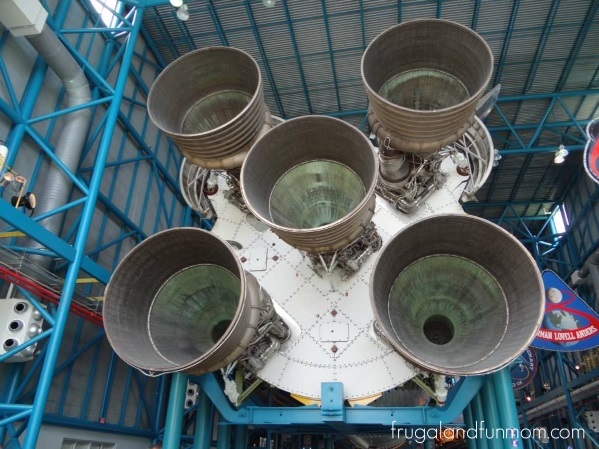 Once the presentation was over, we entered a warehouse where the Saturn V Rocket is kept. It is longer that a football field and taller than 2 Statues of Liberty. We walked around it and under it, and there were plenty of displays and information about the rocket and the program. 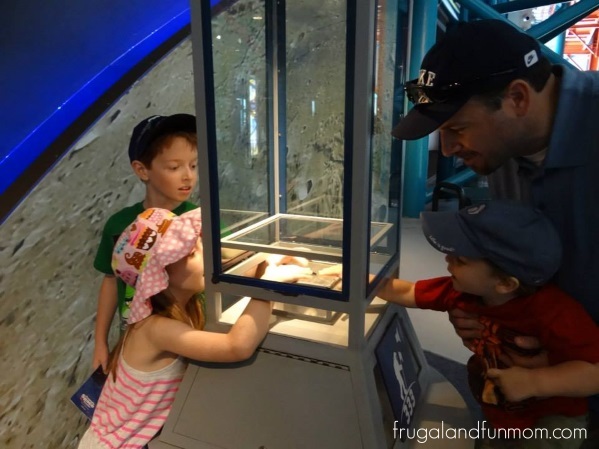 As we went along, we also saw a Moon Rock. Of course we all had to touch it. Some of us (a toddler I know) had to do it twice. We then went into a room where they house all of the old Astronaut gear. 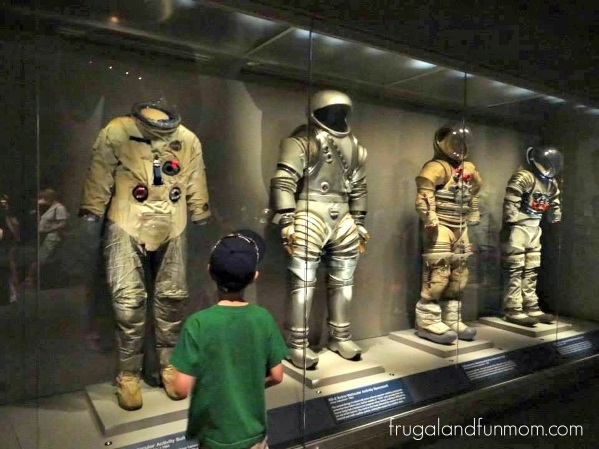 We saw old equipment, molds, and the evolution of the Astronaut suits. 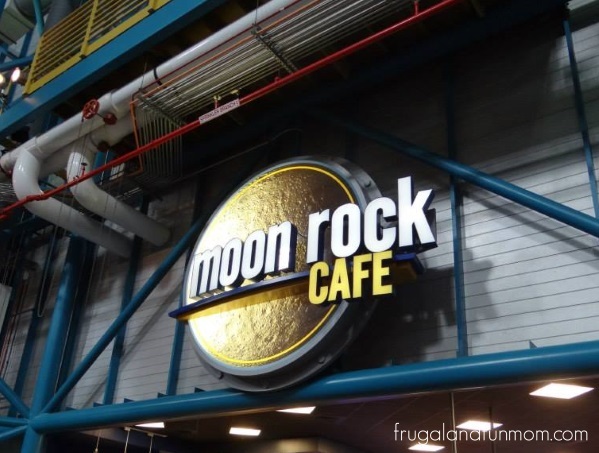 Once we were finished exploring, we took a break and ate at the Moon Rock Cafe. The prices are reasonable, and they had burgers, hot dogs, salads, and more. After that we watched a presentation on the First Moon Landing in another theater. When it was over, we got back on the tour bus and headed towards the beginning of the complex. If it is any indication of how big the place is and what there is to see, we were probably at the Apollo/Saturn 5 Center for close to 3 hours. 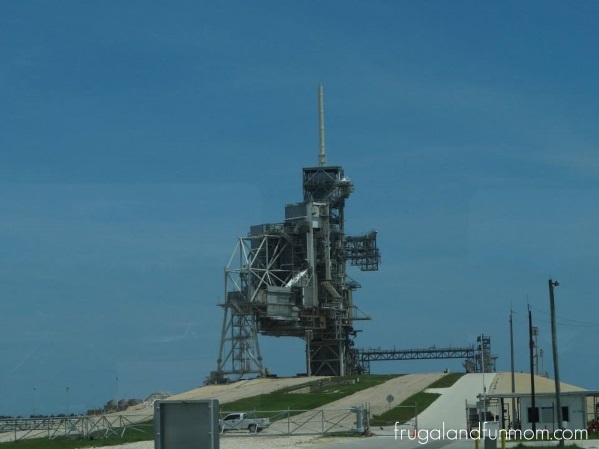 When we returned, we went straight over to see the Space Shuttle Atlantis. I have to admit that I got emotional at this part. They bring you into a room and there you watch a short film on how the Shuttle came to be. Then you walk into another room and they show you multiple take offs. Just as the film is ending, well… you will have to see it in person to find out for yourself. 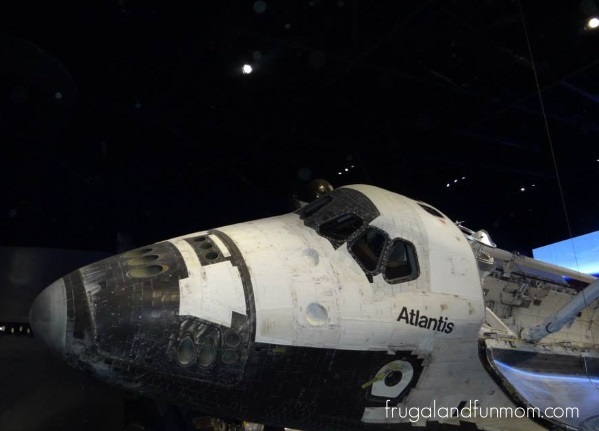 Inside the Space Shuttle Atlantis Complex, there is so much to see and do. 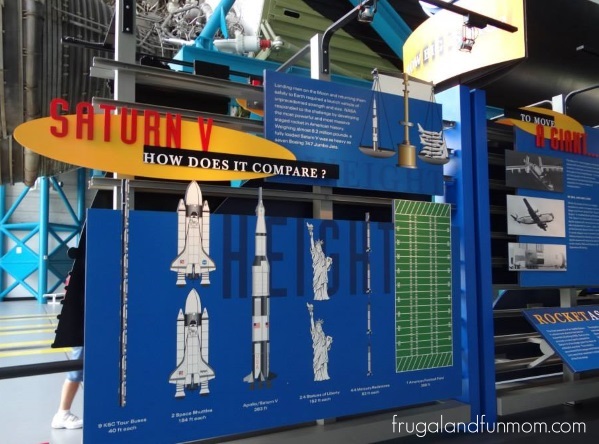 There is a slide for the kids, a miniature Space Station to explore, interactive touch panels, and so much more. There is also a Memorial To Those Who Have Fallen during the Shuttle Missions, and a Shuttle Launch Simulation. 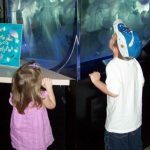 My 2 older kids and I did the Simulator, and it was a lot of fun. 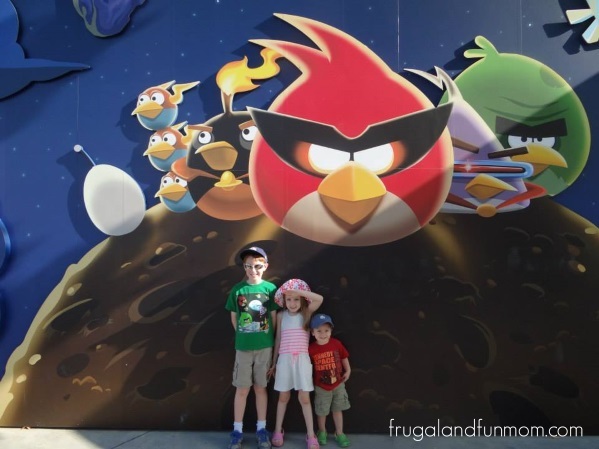 After the Shuttle Atlantis, we made our way over the Angry Birds Space Encounter. There the kids got to play for a little bit. 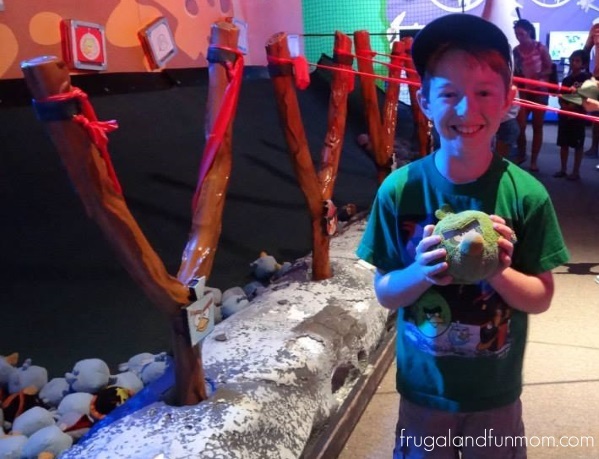 They had a place where you could sling the Birds at those Bad Piggies, and all three of my kids gave it a try. They also have a mirror maze, interactive puzzles, and Laser Tag. We decided to reserve the Laser Tag for another trip. After this, we came across a Photo Opportunity with an Astronaut character and then we went through an exhibit called Robot Scouts. At this point we were starting to get near the end of our day, so we quickly made our way to the Space Shop to pick up some Souvenirs. As we exited, we passed the Rocket Garden, and then went into the Early Space Exploration Museum. We did not make it to the 2 IMAX Theatre Presentations, an Astronaut Encounter, The Astronaut Memorial, and Exploration Space. 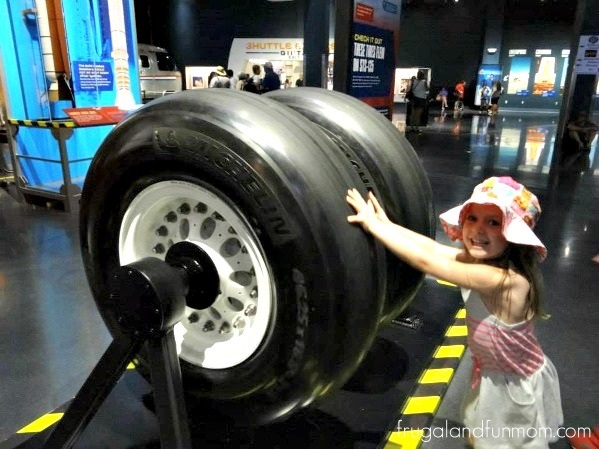 I definitely could have spent more time in the exhibits and could see making a second day of the Kennedy Space Center, or arriving earlier to take it all in. 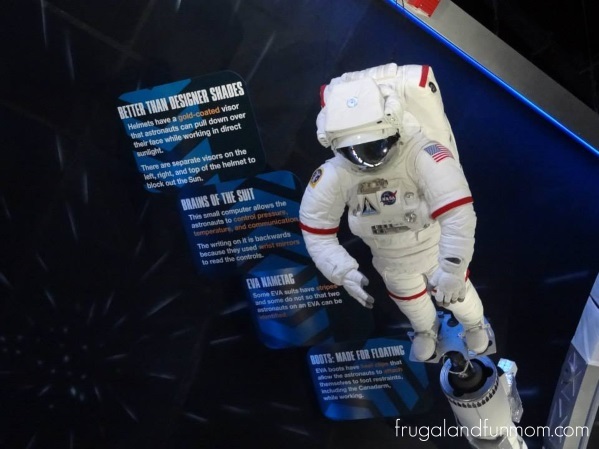 FYI, there is also a U.S. Astronaut Hall of Fame nearby and general admission tickets allows 2 entries in if used within seven days of the initial entry. 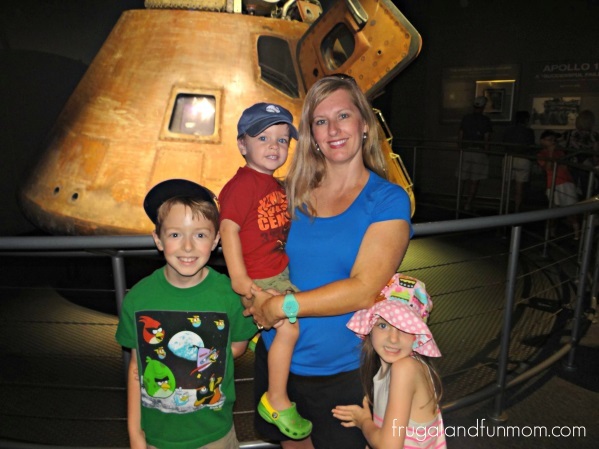 Have you visited Kennedy Space Center before? What was your favorite part? 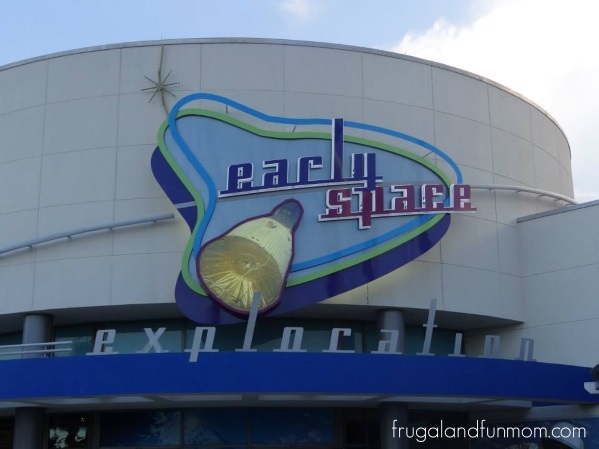 Visit kennedyspacecenter.com for more information about the complex. 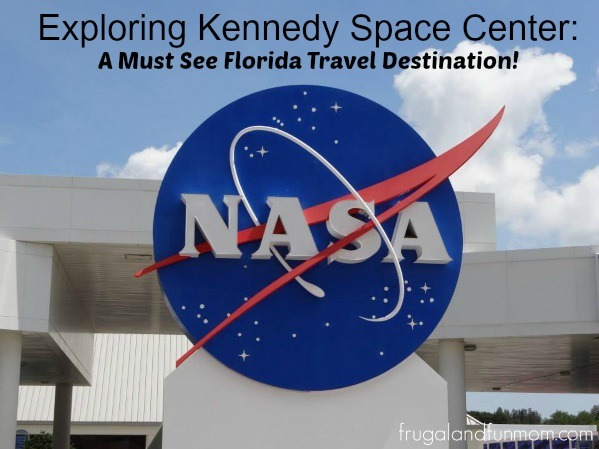 You can also check them out for up to date information on Facebook at facebook.com/KennedySpaceCenterVisitorComplex and Twitter at @ExploreSpaceKSC. 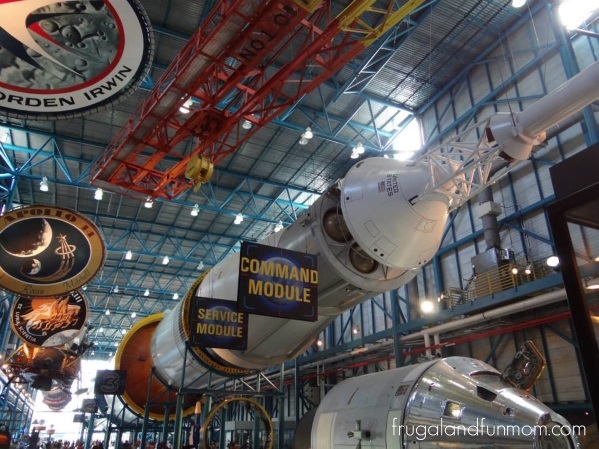 Kennedy Space Center really outdid themselves when it comes to exhibits and the interactive environment. My kids have been talking A LOT about this trip and my son mentioned a few times already that he is ready to go back. We are going to the NASA Space Center in Houston next month because it is close to us. 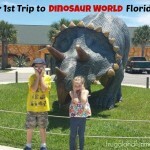 We are going to visit family in Florida in a couple of months, so we may need to make a trip here. It looks amazing! I was just telling my son about this place. I'd love to take him the next time we're in Florida. This looks like such a fun experience! We almost had the chance to go, but not enough time. I hope to make it there with the kids when they get older! Awesome. I have always wanted to go there. Looks interesting and fun. We go to Florida yearly and havent made it down there yet! It's at the top of our list for next year now. This is definitely a must-see Florida destination. It's such an interesting place with a lot for the kids to learn and for the family to talk about. 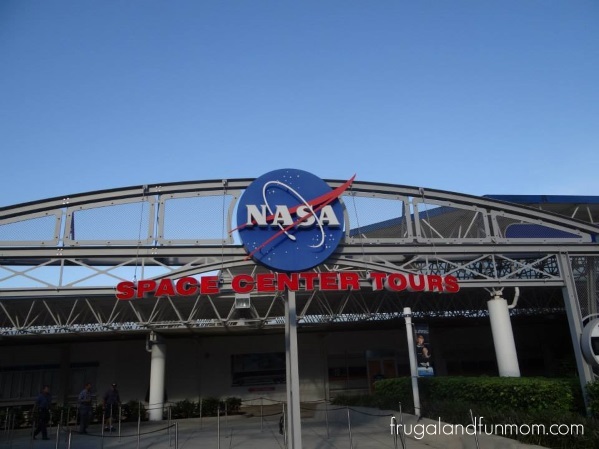 I've always wanted to go to a NASA space center! 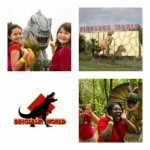 This would be a great little field trip with my kiddos! This is on my list of places to go when we learn about space in our homeschooling. This looks like a great place to visit with the kids. I know my husband would love to go too. 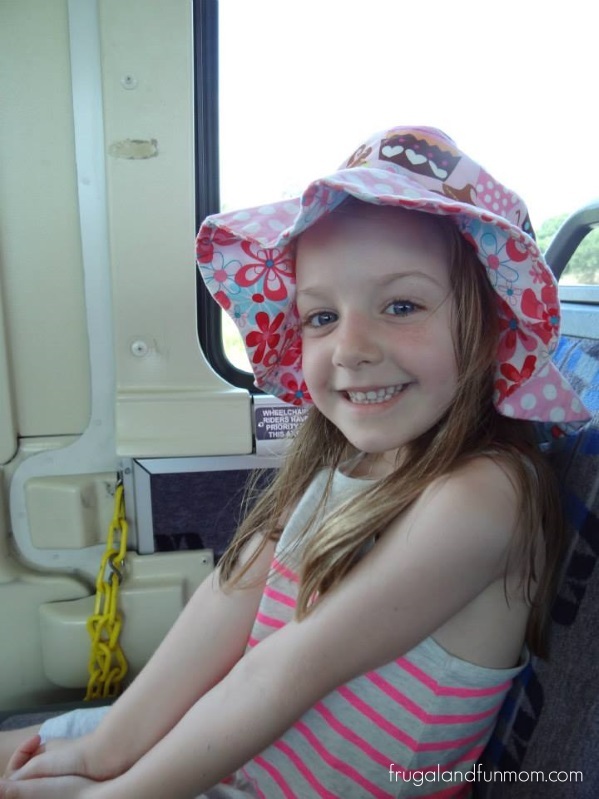 Thanks for sharing so many great photos. I hope we can make it there one day! 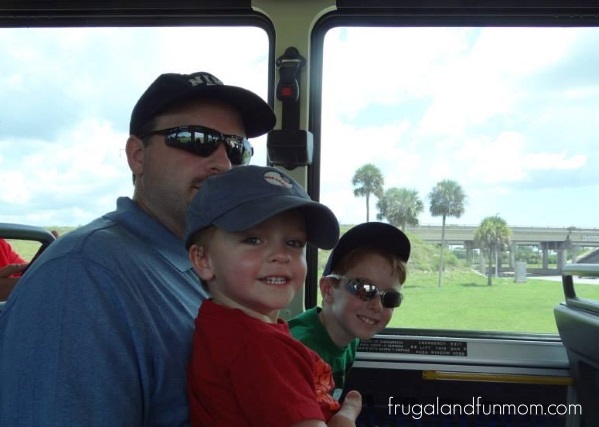 It's definitely on our family travel bucket list. I've always wanted to go there! Great recap and photos - I'd love to see the rockets in person.